I've eaten in Balzac several times in the past, but I want to give another brief mention to this fine restaurant. Several friends and I met there recently for dinner and we enjoyed an excellent 3 course meal for €25 with a bottle of red wine for €15. Certain dishes are clearly marked on the a la carte menu and can be combined for this special deal. I enjoyed crab creme brulee with pickled cucumber to start, duck confit with roasted root veg as a main and lemon posset with strawberries to finish. 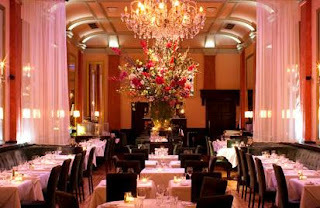 Great food at a magnificent price in a beautiful dining room.